Robert Jeffress, pastor of the 12,000 member First Baptist Church in Dallas, Texas, is rebuking talk radio host Glenn Beck for his recent criticism of evangelical Christians who live in the South and are not supporting Sen. Ted Cruz’s campaign to secure the Republican Presidential nomination. “All throughout the South the Evangelicals are not listening to their God,” Beck said at a rally in Utah on Monday. Beck, a Mormon, has endorsed Cruz and has spoken on his behalf at numerous rallies around the country. “Assuming that Mr. Beck is referring to evangelicals who vote for Trump, I would make a distinction that Beck does not: The Bible certainly offers principles on how to think about government and politics. The Bible does not, however, tell us which individual candidates to vote for,” Dr. Thomas S. Kidd, Distinguished Professor of History and Associate Director of the Institute for Studies of Religion at Baylor University in Waco, Texas, tells Breitbart News. “If other Christians don’t vote for our preferred candidate, we should not say that they are not listening to God. None of us has special access to God’s opinions about candidates,” Kidd says. “There are many reasons why devout Christians should hesitate to vote for Donald Trump, but God has not revealed Ted Cruz as the divinely anointed alternative, either,” Kidd concludes. A number of evangelical Christians who live in the South are also critical of Beck’s fusion of theology and politics. Criticisms of Beck’s attack on evangelical Christians who live in the South and are not supporting Cruz were echoed by several participants in the February 25 Breitbart focus groups conducted of evangelical Christians in Tennessee who said they intended to vote in the March 1 GOP Presidential primary in the Volunteer State. 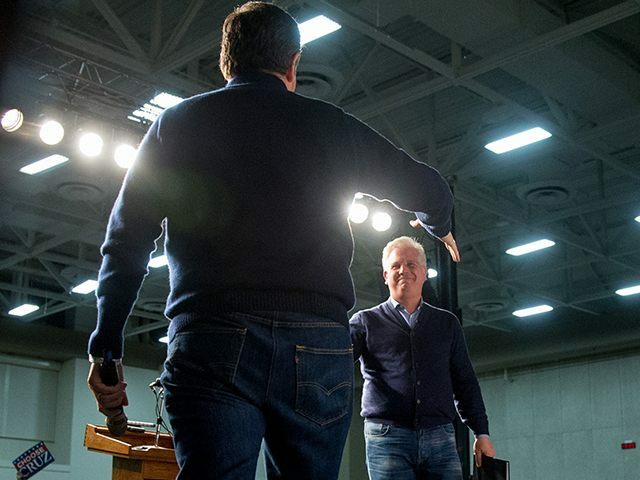 “It has been very disconcerting to see Beck traveling with Cruz,” Elizabeth, who voted for Cruz in the Tennessee primary and participated in one of the February 25 focus groups, tells Breitbart News. “I have had a nagging concern about Cruz’s integrity. His association with Beck confirms this,” she says. “Beck is not reticent about pushing his Mormon faith, which from an evangelical perspective is heretical. Apparently Cruz has no discomfort being called the fulfillment of a false prophecy,” she adds. “The fact that evangelicals have not fully embraced Cruz but Mormons have is troubling to someone who voted for Cruz but now questions the decision,” Elizabeth concludes. “I am disgusted by Beck’s comments and he should be ashamed for casting stones,” Jim, a Trump supporter and small business owner who participated in the focus groups, tells Breitbart News. “Are we counting sins? Let’s see: Cruz has lied on multiple occasions, smeared Trump horribly, wasn’t tithing while making over $250,000,” he adds. “I think he has issues and is in no position to determine who is or is not listening to anything or anyone, including God,” she adds. “His hysterics do nothing but turn me off, whether it’s this or anything else,” she says of Beck. “I think he has done some good exposing some of those leftist relationships that he has exposed. But, once he starts on opinion, he always seems totally off the wall to me. Have thought this a long time,” Martha concludes. “I was offended by Glenn Beck’s comments, as I was by Romney’s speech several weeks ago. ‘My God’ doesn’t tell me how to vote,” Aime Molina, another focus group participant, tells Breitbart News. “I believe God expects me to be involved in the political process for the good of His people and the advancement of His Kingdom,” Molina continues. “I believe I am called to vote according to the morals and teachings of Jesus. I believe we should vote for the candidate who will enforce the expectations of personal accountability for one’s life and actions, and the protection of our Country and its citizens,” she continues. “I don’t believe that God endorses a specific candidate, and Beck’s comments seem judgmental and manipulative to me. I am not anti-Trump; he is my second choice, but for the record I voted for Ted Cruz. And I’m still offended by Glenn Beck,” Molina adds. The February 25 Breitbart focus groups of evangelical Christians in Tennessee confirmed the polling research of the Barna Group, the leading pollster of evangelical Christians, which found that committed evangelicals are more supportive of Cruz and cultural evangelicals are more supportive of Trump.